Tempeh Each Day Keeps The Doctor Away! 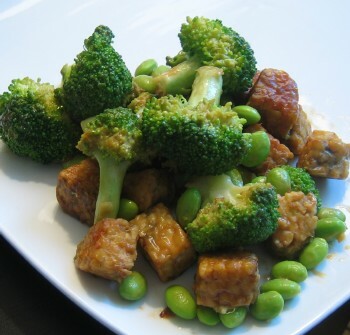 It's true that there are lots of healthy benefits to be gained by eating tempeh which, if you're not familiar with the stuff, is made from fermented soybeans. I always found both tofu and tempeh to be dry, bland, and lacking in flavor but I didn't want this to be the reason that I was depriving my body of such healthy food. I love to experiment with unfamiliar foods and I love a challenge. My curiosity helped me to come up with a flavorful way to enjoy tempeh. I use my ginger peanut dressing that I posted about in Rolling into Summer and I prepare the tempeh by stir-frying it in a little olive oil on the stove to lightly brown all of the sides. Once browned I remove them from the pan and set aside while I stir-fry some broccoli and edamame (the frozen shelled kind). I add everything to a bowl, add the dressing and dinner is served! 1) Cut the tempeh into 1/2 – 1 inch cubes. Heat a pan over medium heat and drizzle a few tablespoons of olive oil. Once the pan is sizzling hot add the tempeh and stir-fry until it gets golden brown on each side. Remove from heat and set aside. 2) Prepare dressing while the tempeh is on the stove – keep an eye on it though and stir occasionally. 3) Add a few more tablespoons of olive oil to the pan and add the broccoli, garlic, and edamame. If you like a touch of heat add a pinch of red pepper flakes. Once the broccoli loses it's rawness and the edamame is heated through remove from heat and add into a large bowl. Add the tempeh. Add the dressing and mix all together. You may have some dressing left over depending on how much broccoli and edamame that you use – I often have extra dressing left over that I use for other things during the week – it's great as a dip for veggies. Note: Adding some crushed peanuts on top adds a delicious crunch! Instructions: 1) I mix all the ingredients together – adding the water last so that I can control for the viscosity. As you'll see, the peanut butter "melts" when you start stirring it with the soy sauce and other ingredients – stir very well until everything is combined. That looks spectacular! I love broccoli. Yum !! I love tofu and it would be so great with that dressing and those veggies. Never tried tempeh !it’s all about the marinating!! You have made crave broccoli and tempeh! I’ve finally caught up on all your recent posts – now I’m starving and I still have two hours of work left! Keep it up girl – and know that I’m on the edge of my seat waiting for another video post. I made this the other night – very tasty and healthy! I think the key to the tempeh is cutting into small enough pieces and truly stir-frying them so they feel & taste cooked. Although my dish was very good, I should have paid more attention to the directions, as I just let large cubes of tempeh sit undistuurbed in my pan resulting in semi-cooked tempeh. Lesson learned!! That being said, the peanut sauce made it all better. I look forward to trying this one out again! Hi Geneve, I just made this dish for dinner and it was excellent. My boyfriend who had never eaten Tempeh before loved it too. I will definitely make this again. Thanks!